One Woman’s Garbage is Another Woman’s Vinegar? This will round-up our exploration of the few different things we made with red currants this year. I simply decided we were not going to waste anything this season (including the parts we normally discard). So, when we were left with a rich thick red pulp from the process of straining the red currants for jelly I wondered how this pulp could be preserved? And, the same thing crossed my mind for the discarded seeds and skin. 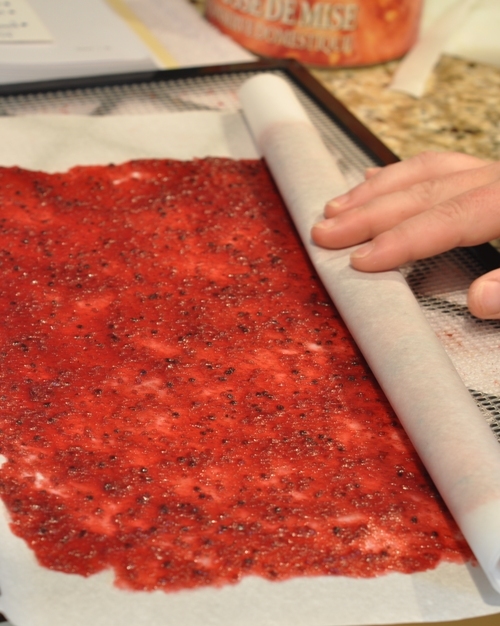 We quickly concluded the pulp would be turned into Currant Fruit Roll Ups and the seeds/skin into Red Currant Vinegar. 1/2 cup of sugar or less ~ Note: sugar was not required for the pulp extracted from the process of making red currant syrup since honey and some sugar were already present. Remove pulp from jelly bag and place in a bowl. Add sugar if necessary but do this a bit at a time. It is very easy to add too much sugar. Place pulp on the waxy side of the dehydrating paper and spread out evenly making sure it is about 1/8″ in the center and 1/4″ on the edges. Place trays in the dehydrator for 8 hours. It is wise to check them after about 6 hours to see if they are done. The fruit leather should be shiny but not sticky. 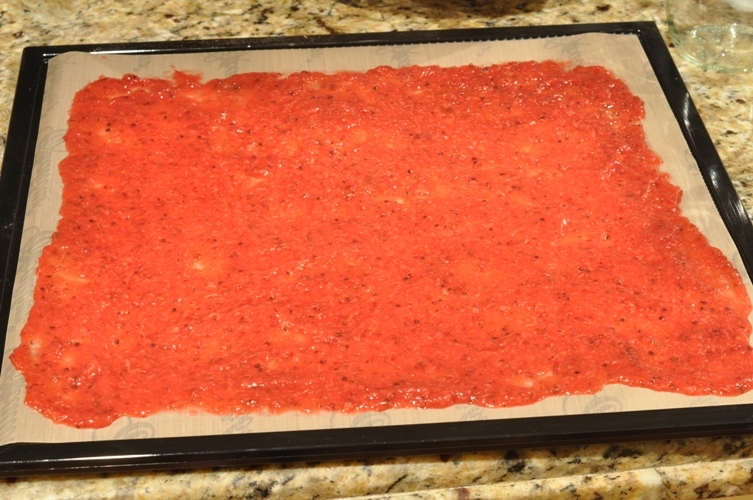 Remove from the dehydrating tray and place on wax paper. Roll the leather and using scissors cut into serving sizes. 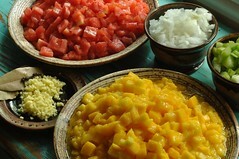 Place in the refrigerator to steep for 2-4 weeks. Taste after 2 weeks to determine if flavours have combined. Once satisfied with taste strain liquid through a jelly bag collecting vinegar in a bowl below and discard used seeds, skin, and pulp. In a medium stainless steel saucepan bring vinegar to a boil and boil for 3 minutes. Remove from the heat. Skim off any foam that may have been created. 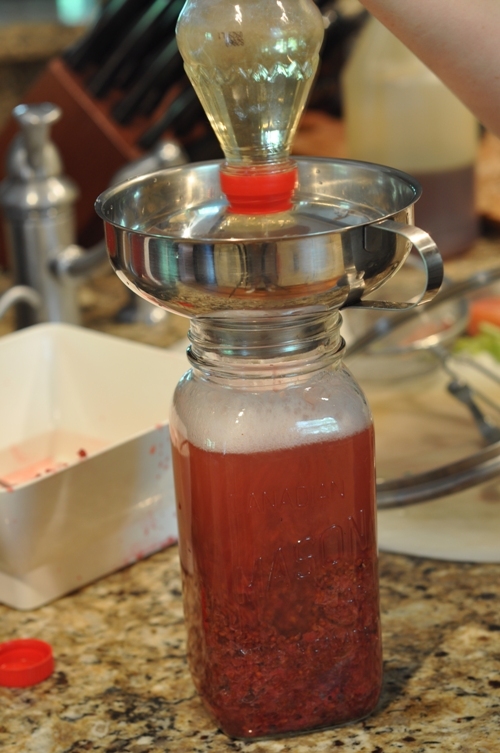 Once cooled, pour the vinegar into clean sterilized bottles. Cap the bottles with a cork, label, and store in a cool place. This vinegar should last 3-4 months but must be refrigerated upon opening. Very little extra effort was required to create these two different items. The fruit roll ups are a huge hit around here and we are excited about finding different uses for the vinegar. All in all a project worth repeating!